It’s been a while since I wrote a post on the blog; all this while I was publishing guest posts submitted by our awesome authors. So today I decided to write something on the important things a blogger must keep a check on while reviewing guest posts. It must be said that in this day-and-age not all guest posters submit posts of über quality, some of them are merely looking for a couple of dofollow backlinks from your blog. So don’t just blindly hit the ‘publish‘ button when reviewing such posts. First and foremost it’s important for us to understand and accept the fact that guest posters are different people with their own unique set of ideas, so when reviewing guest posts one must not critically challenge their opinion just because you disagree with their point of view & you are the editor-in-chief of the blog. Always give guest posters their opportunity to express their point of view. If there is a factual or technical error (which is quite possible) in the post only then use your editorial powers to correct it. When we talk about quality content there are some other factors which come into play as well viz : grammar, originality of the post, whether the points are balanced or not (pros and cons type posts), etc. Most blogging platforms come with a spell checker. For proofreading you can use After the deadline plugin in WordPress. It is very helpful at times. Although you can ignore some of it’s suggestions to keep the post real. Like the uniqueness of thoughts, people write in a different way. Some content writers like to write long paragraphs and others like to divide their post into small one’s. So as a reviewer of the post, it’s your responsibility to rearrange things. A finished post must include an image, but these days I rarely receive guest posts with images in it. Again it’s our job to find images on the internet or create post-specific images using Photoshop in such a case. Internal linking is another way of keeping your visitors engrossed to the blog and it helps a lot in SEO, so another job in the editors’ hands. This is perhaps the most important step in reviewing a guest post as it covers all the bases. Read the post once, fix the grammatical errors, add images, tinker with the format and re-read/preview it again. I prefer saving it as a draft in WordPress and using the preview option once everything is done. The preview option is very helpful as we get an idea how the post would look once it’s published. The author name, bio, backlinks, etc can be checked once again in this step. Trust me reviewing guest posts is not as easy as it looks. So those who don’t receive guest posts don’t crib about it. It’s a hard task unless you take your blog lightly and push-out average content. I am so much impressed by your post “Reviewing a Guest Post”. 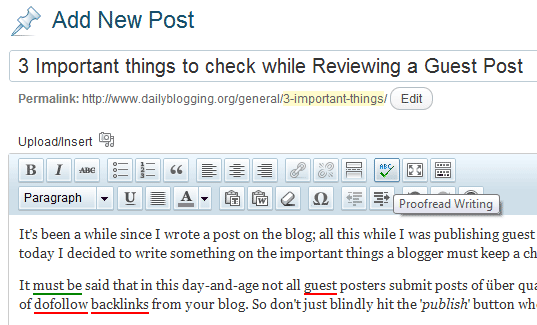 This gives me a clear idea for choosing quality guest posts for better blogging. Reviewing and publishing guest posts can also be a daunting task, especially if there are many guest posts that you receive for your blog every time. I agree with you that one of the most crucial factors before getting to publish a guest post is to check for the quality of the content as there are writers who write differently and may write long sentences while others prefer to write in short precise sentences. Last but not least, re-reading/preview to finalize the post and then publish it is a must to avoid showcasing a post to readers with grammatical errors and broken links. This will surely annoy your readers, and no blog owner would want that to happen. You should always review any guest post before it is published on your blog, as even though the article is by a different author, it is still attached to your blog. Publishing an article with spelling and grammatical errors will reflect poorly on your blog, so you want to make sure any content you put on your blog is well organized and formatted properly. posts. In any case I’ll be subscribing to your rss feed and I’m hoping you write again very soon!